As part of the City of Franklin Arbor/Earth Day, STFB Board member Dr. Sam Gant led a walking tour of Fort Granger. The tour began at nearby Pinkerton Park where Dr. Gant gave an introduction to the history of the fort. The group then followed a walking trail to the Federal fort on the bluff above the river. There, Dr. Gant described details of many of the fort's features, operations, and history including the "Incident at Fort Granger" in which two suspected Confederate spies where hung. Fort Granger, a Franklin City Park, is open to the public. We thank the City of Franklin and the Parks Department for their efforts preserving and maintaining this important Civil War site. The tour began at the Fort Granger historical marker. Click the image below to read the maker text. occupation of Franklin as well as during the Battle of Franklin. the use of the rifled musket during the Civil War. From its construction, beginning in March 1863, through the Nov. 30, 1864, Battle of Franklin, the Fort Granger Garrison played a significant role both in repelling two strong attacks during 1863 as well as in the better-known, bloody Battle of Franklin. The imposing fort with the Federal troops garrisoned there made a major impact on the citizens of the occupied town of Franklin. 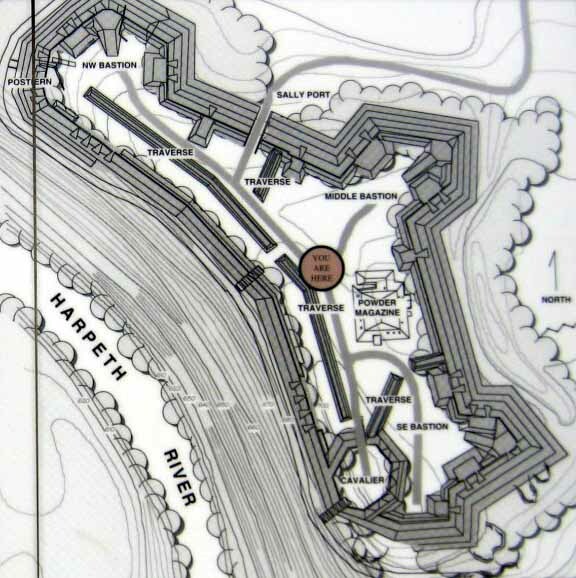 The Federal Garrison centered on the earthworks fortification on Figuers’ Bluff. Detached works included Gen Granger’s headquarters at a smaller works some 700 yards east at Ralston Lane, gun emplacement on Liberty Pike east of Ralston Lane, Roper’s Knob observation post, small earthen fort near the Harpeth River west of the railroad, and gun emplacement on Franklin Pike across from present day Harlinsdale Farm. By April 1863, 7,922 Federal troops were stationed at Fort Granger including 2,728 cavalry. Campsites, drill fields, sentry posts, stables, and storage facilities occupied the area from Murfreesboro Pike to fields west of Franklin Pike. Warehouses and corrals along with guard posts were situated near the well-guarded railroad, the site of present-day Jamison Station.